For years, dollhouses have been on almost every little girl’s wish list. However, the first doll houses were not created for children. They were created in the 17th century for adults – and were never to be played with by children. Doll houses were used to represent the wealth and social status of a family. Doll houses were primarily used in Germany, Holland, and England – for display only. German doll houses were called dockenhaus, which means “miniature house”. I bet you thought it meant doll house, didn’t you? In Holland, they were called “cabinet houses” – the front of the house actually opened and closed much like a cabinet. They could be opened for display or closed and locked to conceal small, expensive collectibles the family owned. In Nuremberg, doll houses were not used to display wealth, but were utilitarian in nature. Called “Nuremberg kitchens”, these metal houses were used to teach girls how to set up and properly care for a house. Little girls were taught how to manage the running of the house and how to manage the servants. In the 18th century, the wealthy in England introduced the “Baby House” – an exact replica of their own home, right down to the furniture (Source). These, too, were not play things, but used to display the wealth and high social status of the family occupying the original home. At a glance, guests could take a tour of the entire house and see all the expensive furniture that could be found in the home. The 19th century finally began to move toward the doll houses that we see today. However, it wasn’t until the Industrial Revolution made mass-production possible that people began to consider doll houses as toys. After World War II, in America, doll houses became both mass-produced and affordable – finally, the doll house was on every little girl’s wish list. In the 1970s, doll houses were extremely popular. As technology advanced and children began playing with electronic toys, the excitement over doll houses lessened. However, in recent years, that excitement has begun to increase, and doll houses are once again one of the most sought-after toys for little girls – their own private home run on imagination. One of the key features of a dollhouse is the material used to construct it. Wooden dollhouses are usually the most durable and can last for years, to be passed down from one generation to another. 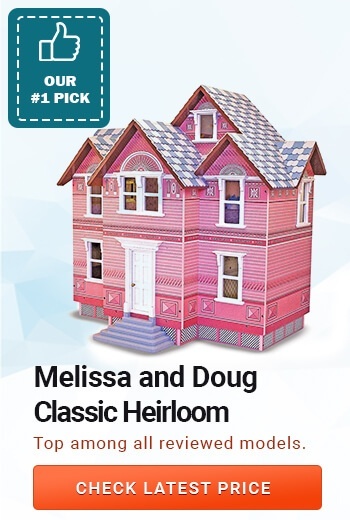 The Melissa & Doug Classic He irloom Victorian Wooden Dollhouse is an example of one of the best wooden dollhouses on the market today. The mission of the Melissa & Doug company is to “Take Back Childhood” by offering quality products that promote free play, creativity, problem-solving, and other cognitive and motor skills that will stay with your child for a lifetime. 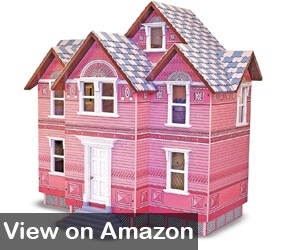 The Classic Heirloom Victorian dollhouse is a beautiful pink with hand-painted shingles and other intricate details that will provide your little one with hours of imaginative fun. 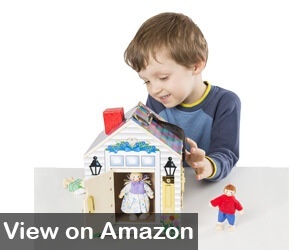 Melissa & Doug wooden dollhouses are handcrafted for quality and authenticity. Intricate details include hand-painted shingles and ornate window frames. Each of the six interior rooms are uniquely decorated and feature turned balusters and finished floors and unique wall coverings. Easy to assemble – one type of screw is used for assembly, so there is no sorting and trying to find the correct screw for each piece. Works with any 1:12 scale dolls and furniture. Furniture sets and dolls are sold separately. Most dollhouses are designed with older children in mind. The Melissa & Dough Company believes even younger children are ready to be introduced to free and imaginative play. The Melissa & Dough Take-Along Wooden Doorbell Dollhouse is one of the best dollhouses for toddlers. The sturdy wooden structure will last through all the imaginary situations your toddler can create. From one of the leading manufacturers of children’s toys, this sturdy dollhouse will be a hit with almost any toddler – including the boys! Designed with 4 doorbells that ring. Has 4 lock-and-key pairs so your toddler can lock and unlock doors – just like in real life. Includes 4 poseable play people. Dimensions are 9 x 6.8 x 6.8 inches – making it the perfect size for toddlers. Attached carry handles make this dollhouse extremely portable – perfect for play at grandma’s house or a friend’s house. Many parents feel the keys and door should be color-coded so children do not have to try each key with each door. By the time your child is 3 , he/she should have developed (to some extent) the following skills: copy adults and friends; play with toys that include buttons, levers, and other moving parts; play make-believe with dolls, animals, and other toys (source). These are all skills that will enhance your child’s experience with a dollhouse.The Fisher-Price Loving Family Dollhouse is one of the best dollhouses for 3-year-olds. It opens for play and has 4 floors with 6 rooms. The dollhouse includes a Mom, Dad, Baby, sofa, and baby seat. More accessories can be purchased separately. Folds easily for storage – store the accessories on the inside when folded. Complete with a second-floor patio and flip out swing set that has 2 swings. Fisher-Price is one of the leading manufacturers of toys for babies and children. 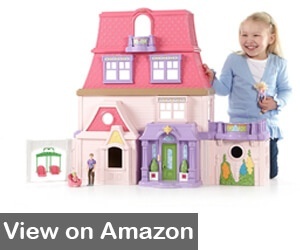 Compatible with furniture and accessories from other Fisher-Price dollhouses. 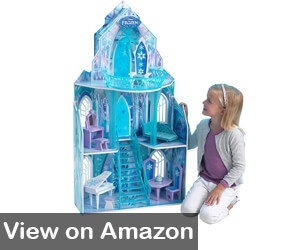 The KidKraft Disney Frozen Ice Castle Dollhouse is one of the best dollhouses for 4-year-olds – especially 4-year-old who have fallen in love with everything Frozen. With three levels constructed of composite wood and molded plastic, the Disney Frozen Ice Castle is built to play and built to last. Based on the movie, Frozen, the Ice Castle features a royal chandelier, fun-themed artwork on each panel, a molded staircase that goes from first to second floor, and an ice throne for Elsa. Your child will have hours filled with fun and imagination with this realist replica of the Frozen Ice Castle. Includes 11 pieces of furniture for your child to furnish the Ice Castle. The Ice Castle is big enough for multiple children to re-enact scenes from Frozen together. Solid construction ensures this dollhouse is built to last. Blue plexiglass windows for an authentic Frozen look. By age 5, your child’s imagination is running wild. Your child is also beginning to learn the difference between realistic and pretend. At this age, the more realistic the toy, the better your child likes it. 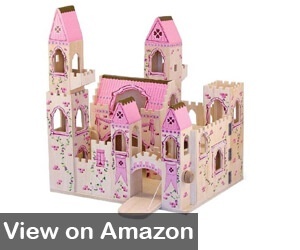 The Melissa & Doug Folding Princess Castle is one of the best dollhouses for 5-year-olds. For authenticity, the castle includes two removable turrets, balconies, an arched walkway, towers, and a working drawbridge. The castle opens and creates a courtyard and stable area. Sturdy wooden construction gives your child years of imaginative play. Natural-wood walls and painted pink details provides a style that is not “babyish”. Closes compactly so storage is easy – your child can also play with the castle while in storage mode. The working drawbridge, turrets, courtyard, and stable give this castle a truly authentic feel that will boost your child’s imagination and lead to hours of royal adventures. Castle is hinged so it is easy to open and is locked closed when folded for storage, making it easier to move from room to room. 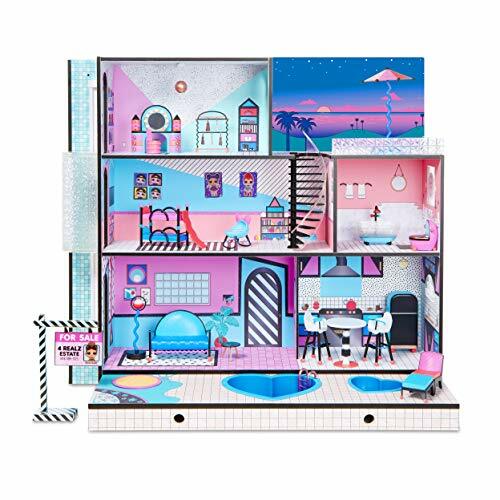 The KidKraft Majestic Mansion Dollhouse is one of the best dollhouses for 6-year-olds – and is also one of the best KidKraft dollhouses. At 4 ½ feet tall with 8 rooms, there is plenty of room for more than one child to play. Three stories plus an attic room provide lots of opportunity for imaginary play. This house is designed for authentic family adventures and includes kitchen, living area, bathroom, bedrooms, dining room, baby nursery, patio, and garage. Beautifully designed and decorated, this is definitely a dollhouse that is on every child’s wish list. Movable parts, including an elevator that glides between the second and third floor as well as garage doors that open and close. Walls are painted to represent authenticity for each room – painted closets in the bedroom, mirror and towel holder in the bathroom, baby décor in the nursery. 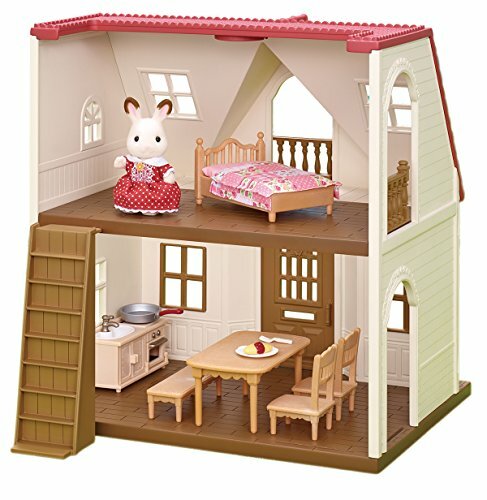 Includes 34 pieces of furniture and accessories for your child to decorate the 8 spacious rooms. Wide windows on both sides allow your child to view the inside from different angles. Kids of all ages love dollhouses. Both girls and boys love to play make-believe and pretend to be mommy or daddy. 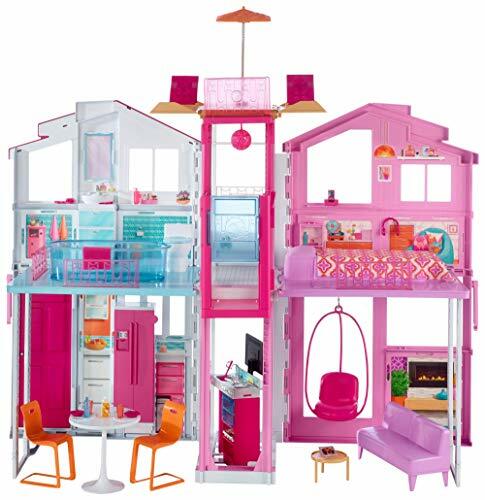 One of the best kid’s dollhouses on the market is the KidKraft Dreamy Dollhouse. 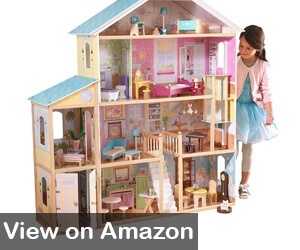 This dollhouse is large enough for multiple children to play – complete with moving parts, sounds, and lights. 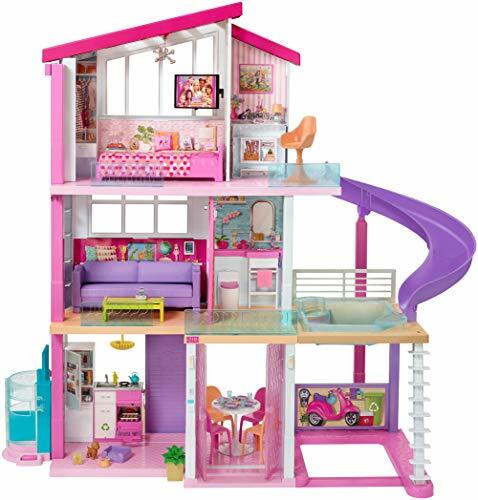 The Dreamy Dollhouse features 3 levels with 4 rooms and 2 balconies. Authentic details give your little ones hours of fun and imaginative play within the walls of their very own beautifully decorated home. 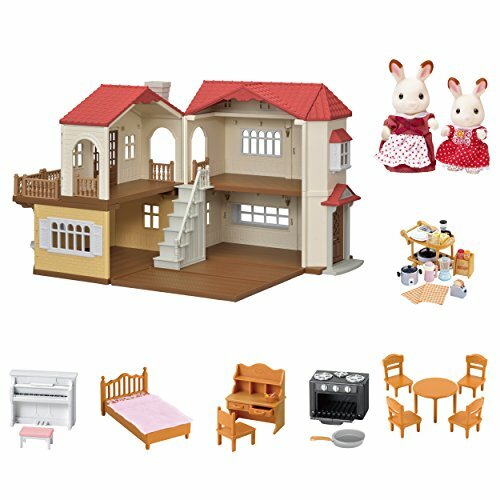 Recommended for children between the ages of 36 months to 15 years, this Dreamy Dollhouse provides years of entertainment. Includes 14 pieces of furniture, including a grand piano that plays music. Has a working door as well as a working elevator that glides from the first floor to the third floor. Lights and sounds for an authentic feel of home – flushing toilet and lamp that lights up. Compatible with dolls up to 12 inches, including Barbies. Sturdy wooden construction makes this dollhouse sturdy enough to withstand years of play. Assembly can be difficult and challenging. 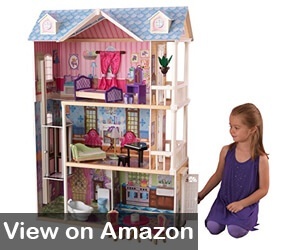 Dollhouses are great educational and developmental toys for children. Not only do children learn to use their imaginations, but they also learn social skills and other cognitive skills that will help them throughout their lives. Children learn to use their imaginations and tap into their creativity as they develop different scenarios for their dolls to act out. Simple things, such as mimicking mom or dad preparing meals or tucking baby in, teaches them about emotions such as love and empathy. Promotes independence and learning to care for others, which helps children learn to develop and maintain relationships, such as friendships. Having their own “house” teaches children to take care of their belongings and to develop responsibility in chores such as putting away their toys, cleaning their rooms, and pitching in to help other complete tasks. Helps children develop social skills as the act out scenarios with their friends, work together to develop the storyline for the adventure, learn to communicate, and learn to share with others. Promotes fine and gross motor skills as your child decorates, works moving parts, and places dolls in different position to act out the imagined scenarios. Though the first dollhouses were strictly for adults – and used most often to show off their wealth – dollhouses have come full circle from hands-off to hands-on. Dollhouses provide many opportunities for children to develop their imaginations, enhance social skills, and promote cognitive and motor skills that will last a lifetime. These learned skills will carry over to your child’s schoolwork and social/extracurricular activities by preparing him/her for the real world and the interactions that create confident, self-reliant children and adults. As parents, it is our responsibility to provide children with learning experiences that promote their development in the safest environment. As with any toy, always follow the manufacturer’s recommendations for age, size, and appropriate use of the toy. Here is a grand idea – get down and play with your children and their dollhouse as often as you can. For most of their informative years, we, the parents, are our children’s most constant educators. Plus, you are NEVER too old to play with a dollhouse!